I live in the USA, and our flag colors are Red, White and Blue. I always check the LIM challenge the first moment I can get on my computer each Saturday. I thought a lot about what I would do with this challenge, but I did not have time until this morning to do anything with my thoughts. Very early in the day today, I saw THIS post from Susan Raihala of Simplicity. Susan's work always moves me. I wish I could see things through her eyes. Susan used the Acrylic Block Stamping technique in her creation today - one I have never seen before. When I viewed Susan's creation with this technique, I immediately knew what I would do for the LIM challenge. My card is a CASE of Susan's, but it has it's own character. After trying this technique several times on white card stock, I decided I needed to use water color paper and I loved the results. I am so pleased with this creation. I really love it, and I know I will use this technique again and again. Thank you so much for coming to view! I haven't used that technique in awhile - thanks for reminding me about it with your BEAUTIFUL card. Just lovely. TFS! That's an amazing effect Stephanie, I have forgotten all about it after seeing Susan's card! This does it for me Stephanie, its wonderful! great card, love your background, it gives an amazing effect. Oh my goodness! What a lovely card! The background turned out beautifully and works perfectly with your sentiment. LOVE the colors, too! I LOVE how that blue background came out, it is perfect for behind that bird. I'm gonna have to try that one. Your card is beautifull. And that technique. I like it to. I've seen it somewere else but the way Susan is doing it with the twinkling H2O is also beautifull. Just love this Stephanie, I think that random splodgy effect is simply tremendous! What a truly beautiful effect, just like a dappled summer sky. Well done on such an original card! This is beautiful, Stephanie. I love the effect you've created. The red bird looks beautiful against that beautiful blue. I must give this technique a try, as well! Stephanie, you totally rocked this challenge!! 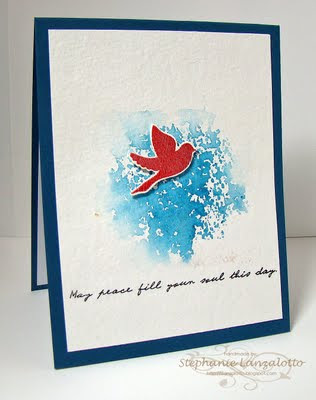 I love the effect of the watercolor....what a fabulous card! You are the woman! What a beautiful splash of blue on water color paper! And your red bird - it goes so beautifully with the sentiment! You've inspired me - love that technique!